Port Phillip & Westernport CMA’s Regional Landcare Facilitator, Karen Thomas, has been investigating ways that farmers can improve their farm biodiversity in combination with adopting sustainable land management principles. Developing and introducing methods, such as native vegetation insectariums, allow growers to better understand the diversity of beneficial insects on their farm, the services these insects provide, the timing of their abundance or critical life stages for bio-control alongside softer pesticide options, will mean growers can vastly improve their IPM strategies and environmental assurance. A lot of research on this topic has been done in the past by Retallack Viticulture in South Australia, but other than a single vineyard in the Pyrenese, there didn’t seem to be much known about the practice in Victoria. Karen used the South Australian research to design a simple on-farm trial with Fielderberry Farm in Cockatoo, with the aim that it could be easily replicated by growers in the Port Phillip and Western Port region. Fielderberry Farm began preparing areas for planting by using a light herbicide spray, and a team planted the areas with native tubestock in August 2016. 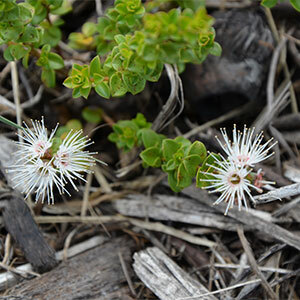 Indigenous plants that complied with the documented Ecological Vegetation Class were used, alongside some non-local Indigenous plants, to be used as bush foods. 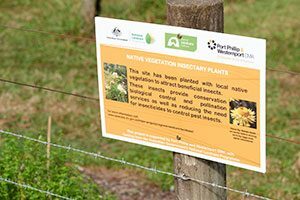 A main insectary was planted along a fence line between two paddocks. This will become a multi-strata shelterbelt creating a corridor from the existing native vegetation on the property (63 acres) into the production area (containing Rubus sp and Blueberries). Smaller plantings were scattered across the production area in pre-existing empty garden beds and surrounding the ‘you-pick’ gazebo. The owners of the property gained local planning permits to construct a restaurant onsite, so the incorporation of bush foods and citrus not only provides nectar during flowering phases but can be freshly harvested to supply the restaurant, once operational. To achieve good land management outcomes, we need to demonstrate success and the results gathered at the trial site to date are very promising. To monitor insect diversity and abundance across the property, sticky traps and pit fall traps were installed, with monitoring being conducted monthly from October 2016 to January 2017. Within ten weeks of planting, several native plants were already flowering and the new insectary had an abundance of Hover flies. 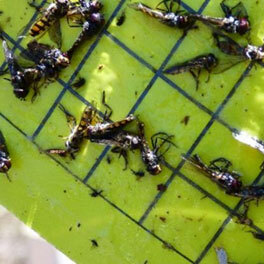 A staggering 232 hover flies were counted in the ten week old flowering insectary. Interestingly, these numbers were not found anywhere else across the property – only in the newly planted vegetation. Hover flies are highly beneficial and after feeding on nectar, the females seek out aphids to lay their eggs alongside as prey for hatching larvae. Monitoring will begin again in September 2017. Learn more the process used to establish farm insectary plantings without impeding on production in our fact sheet. A number of templates are referenced in the fact sheet. These can be download using the links below. To find out more contact Karen Thomas on 8781 7945, 0427 780 170 or karen.thomas@ppwcma.vic.gov.au. This project is supported by the PPWCMA, through funding from the Australian Government’s National Landcare Programme.